On August 1, 2012, members of the Siria Valley Environmental Committee (Comité Ambientalista del Valle de Siria) traveled to Tegucigalpa for a press conference about the health impacts of the San Martin mine. PROAH accompanies the Siria Valley Environmental Committee, whose members have been criminalized for their efforts to defend the environment, and was present for the press conference, held as part of the Continental Day of Action Against Canadian Mega Resource Extraction. 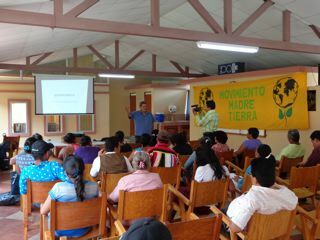 It was led by Dr. Juan Almendares, a medical doctor who has worked extensively with communities affected by the mine in Honduras and the coordinator of the Movimiento Madre Tierra (Mother Earth Movement) of Honduras. The San Martin mine, owned by Canadian mining company Goldcorp, operated in the Siria Valley from 2000 until 2008. Dr Almendares and community members report that the mine has left behind a legacy of health and environmental problems due to the mine’s contamination of the water in the area with heavy metals. According to Dr. Almendares, when the mine opened in 2000, only 8 out of every 100 people in the area had skin problems. Ten years later, after the operation of the mine, this figure has increased ten-fold, to 80 out of every 100 residents. High levels of heavy metals – lead, arsenic, and mercury – have been found in the blood of both children and adults in the Valley. The first half-truth they cite is the claim that “the new law better protects natural resources,” noting that “the truth of the new law” is that “it makes it possible for buffer zones of protected areas to be subject to mining concessions, it fails to safeguard the human right to water for the population, … removes from municipalities their authority to designate zones as protected, … [and] relaxes the requirements for obtaining an environmental license.” Read the whole statement from the National Coalition of Environmental and Social Networks of Honduras here. This entry was posted on August 28, 2012 at 12:23 pm and is filed under HAP Articles, News. You can follow any responses to this entry through the RSS 2.0 feed. You can leave a response, or trackback from your own site.